Birmingham-based engineering company, adi Group, has reaffirmed its pledge to help bridge the gender divide in engineering by growing its pre-apprenticeship scheme. Despite recent figures showing more people are entering apprenticeship schemes than ever before, for every female apprentice working within the UK engineering sector there are 25 male apprentices. Identifying a need for high-quality vocational training for all genders, the Group launched the UK’s first pre-apprenticeship scheme in September 2016 for 14-16 year olds – 25% of whom are girls. The scheme involves 12 secondary school students – male and female – attending adi Group’s Birmingham workshop for half a day each week to practical, hands-on skills needed to carve a career in either mechanical or electrical engineering. The two-year course runs alongside the students’ GCSE education, occupying 10% of their curriculum time. Pre-apprentice Alicia Southerton, 14, said: “My dad works at Jaguar Land Rover in Solihull, and it’s always sparked an interest of engineering in my mind since I went to his work. 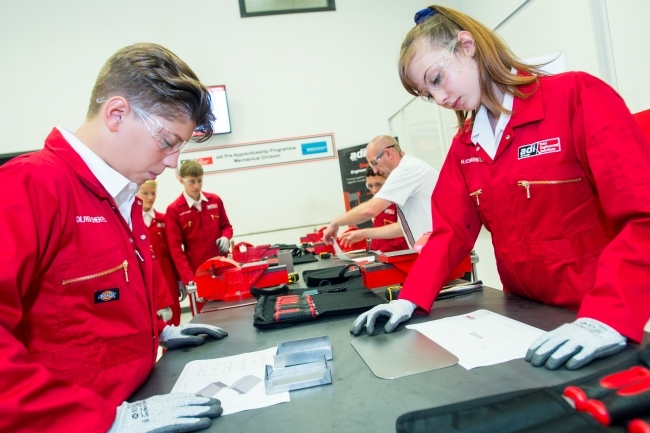 Alan Lusty, CEO and founder of adi Group, comments: “Our pre-apprenticeship scheme links together industry and education to show school age children the benefits of engineering and present it as a viable career option. “We hope that by taking on a healthy proportion of male and female apprentices each year we can contribute to closing the skills gap, ensuring that well-trained, dedicated professionals continue to enter the profession.